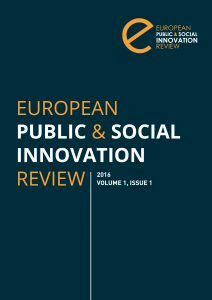 The European Public and Social Innovation Review (EPSIR) is edited by Sinnergiak Social Innovation and published in English. EPSIR is a bi-annual and a peer-reviewed magazine. EPSIR is an open Access magazine and its misión is to contribuate to the reseach on the social innovation and public sector field. EPSIR gives valorations of the activities of different actors through a rigorous theorical and methodological research that explores the implications of the social innovation policies.